Victoria York Design is a premier luxury, full-service stationer based in Paradise Valley, Arizona specializing in weddings. Offering exquisite invitations and social stationery, I love to spoil my clients with personalized service, fabulous design, and a truly collaborative, one of a kind experience. Clients can expect to receive personalized service that brings their wedding day vision to life…on paper. I like to say I’m in the business of love and I am genuinely excited every time I sit down with a new client. I love to hear their love stories and my approach to invitation design is to tell their love story through thoughtful custom design. I also want to help generate guest excitement when they receive your beautiful invitation in the mail and I often joke with my clients that I can’t be held responsible for all the guests who reply yes because the invitation is just too beautiful to say no to. Each custom invitation suite is designed so that you receive exactly what you’ve envisioned since the day you said yes. Wedding stationery design can range from the fun, sweet, and whimsical to the traditional, classic, and elegant. From save the dates to total knock-out invitations and a plethora of wedding day stationery options, there’s nothing on your Pinterest board that can’t be brought to life. Making your wedding day dreams come true is what I do best, and it all starts with the invitation! I am a dedicated wife and mother of twin boys and began designing invitations in 2003 in celebration of my son’s first birthday. 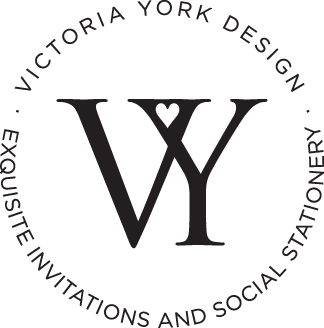 After designing the first wedding invitation in 2007, I became passionate about design and working with engaged couples and established Vee Creative, now Victoria York Design, in 2010. Happily married for 25 years, I am truly jumping up and down excited to meet couples on their own special journey. Let me be the most fun part of your planning process! I have been married since 1994 to the love of my life. We have twin boys and a dog. I am obsessed with fonts. When I meet someone I immediately imagine his or her name in pretty script. My heart belongs to the Arizona Cardinals and the USC Trojans. He wrote a poem describing me. My favorite line is “love fonts, family and friends.” He gets me.